The perfect trend for the spring and summertime. I'm all about the embroidery trend this spring. Even though it has been present in the street style for quite some time now, it's not going away any time soon. Embroidery is having a huge comeback this spring and if you're still not a fan of it, get ready, because you'll be seeing it everywhere. From embroidered dresses, jackets to shirts like in my case, embroidery is the winning trend of the new season. When you combine the simplicity of a white shirt with embroidery, you get a special combination of femininity and sophistication. Classic white shirt is the ultimate staple piece of clothing every woman should own in their closet. It's the easiest piece to incorporate into an outfit - you can easily dress it up (with a skirt) or down (with a casual pair of jeans). 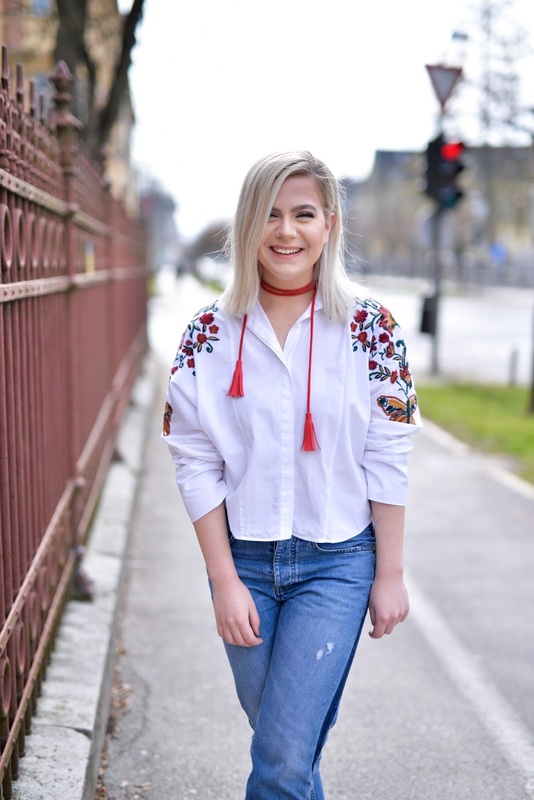 I decided to pair this gorgeous embroidered shirt with frayed hem jeans, both from Zara, added Bershka black strappy heels and finished everything off with a red MKS necklace. Perfect casual outfit for the springtime. What do you think of this trend? Like it or not? Let me know in the comments below. Beautiful white top. Every person nurtures an innate desire of looking good and feel ‘accepted’ in the socio-economic circle. The word fashion instantaneously brings to mind a flash of colour with a dash of glamour.